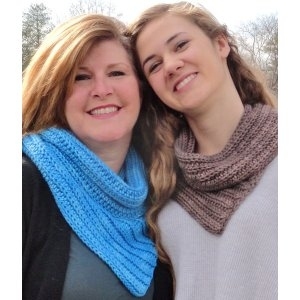 Taken from OneLoopShy Patterns: "This versatile bandana infinity cowl can be crocheted with one or two skeins. It's worked flat and then seamed to create a bandana-style point. " This pattern is from OneLoopShy Patterns - Bandainty. Size I crochet hook (or size needed to obtain gauge) are required but not included. Finished Measurements: 4 (6)" x 52 (59)" after blocking. Gauge: 11 sts and 10 rows over 4". Color Shown is Betine and Alpine Blue.